New painting in progress this morning. Reference photo is from my favourite St. Lucian photographer, I’ll talk more about that when the painting is further along. I don’t really want to talk much about it yet, except to say that the title is Journey to self. I was done with the timelapse early this morning, but for some reason I really, really procrastinated in writing this blog post. The peony painting from yesterday is not done, but I usually start something new before going back to finish the first. That’s how I keep the momentum going. In fact, I got photos to create two paintings based on my friend’s photography, three months ago! But I had big plans with trying a new technique, which involved me taking a laser cutting 101 workshop at the local library. I’m glad to have finally started this painting, but I have to say that things got out of hand pretty quickly. I aimed the camera at the figure in the painting, intending to just work on her. Which is opposite to the norm of going from large masses to smaller details. My reason for doing that is that I was planning to use custom stencils to create patterns in the landscape, later on. But as I went along, I got into a bit of a frenzy, moving to bigger and bigger brushes and working larger and larger areas of the canvas, some of which were out of view . Also, I had started working with a new staywet palette for this painting, but when I needed a pink, I decided to open up the peony palette. Before I knew it I was like a crazy person mixing colours in a palette on either side of me! Looks like I’m getting my painting mojo back. Oh, and the consensus on the peony painting timelapse from yesterday, was to keep the sides green. In fact, EVERYONE voted for green instead of black. I’m happy with that. Finally I can share some close up images of the various panels from the Ireland Park mural I painted as part of the Burlington Mural Project, for the City of Burlington, managed by Cobalt Connects. 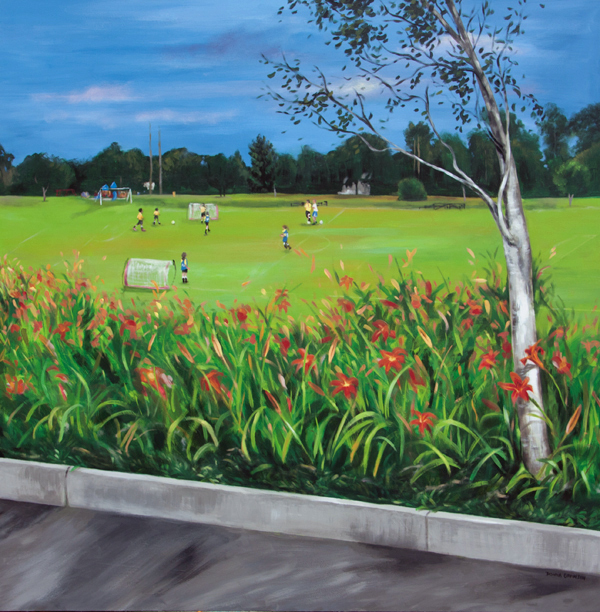 The mural was installed on the exterior wall of a small building which houses a concession stand and washrooms. The building is in the center of a large park – Ireland Park. It includes several baseball diamonds, among other amenities, and is flanked by schools and residential streets. I was selected to be one of the first artists to create murals as part of this project for the City. 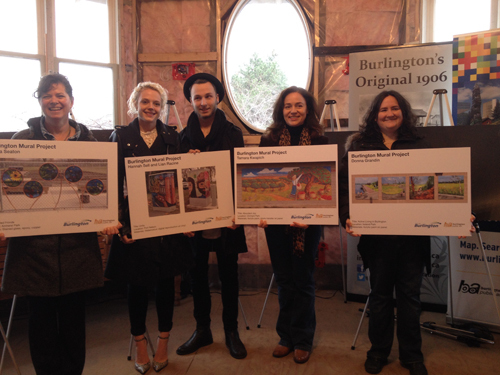 There were 6 murals revealed yesterday at the launch held at Freeman Station. 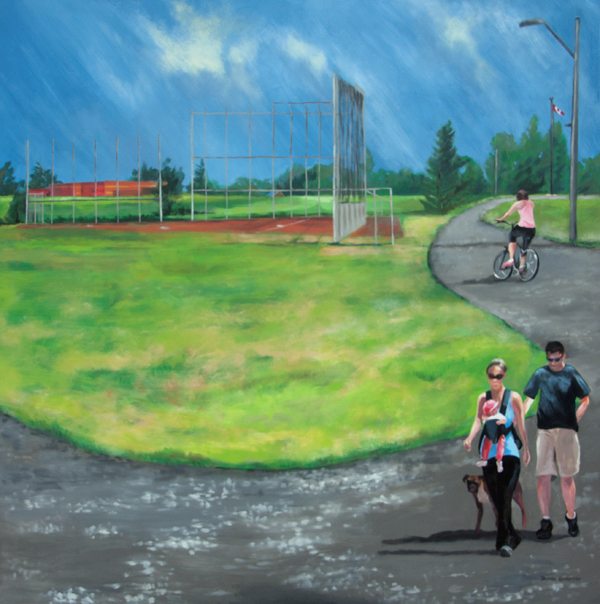 It is an honour to be included in the Burlington Public Art collection. I enjoyed the Murals 101 Workshop & Project Launch hosted by the Burlington Public Art Program in April. This was a special service geared to Burlington artists – an opportunity for artists like myself who don’t have a lot of experience applying for public art commissions. This workshop featured Karin Eaton, Executive Director of Mural Routes and mural artist Allan Bender in a lively discussion about contemporary mural making. They discussed a variety of mural techniques and materials using real life case studies. 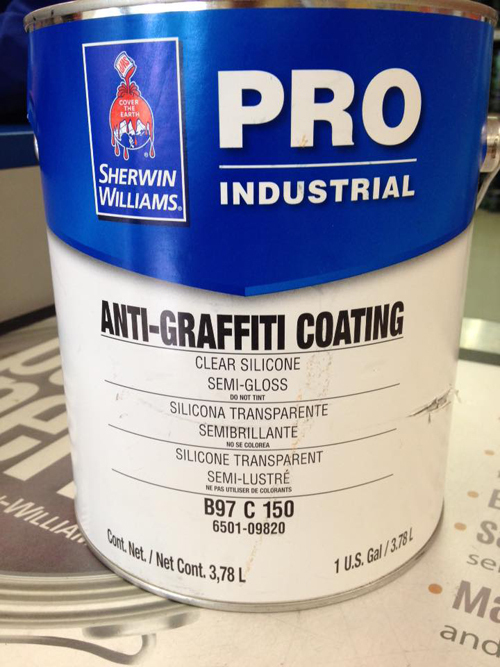 Exploring new materials – anti-graffiti coating was a must for this project. The community was then asked to give suggestions of locations, and themes for the mural. The theme that I worked with was “Quality of life in Burlington, active living, and families, youth, kids”. I am not sure what made me choose to do 4 separate images, rather than 1 large one, but right away I thought of the image for panel 3, and then I picked 3 other Burlington locations. Spencer Smith Park was an obvious choice, it is part of the vibrant downtown, and the waterfront location is ideal for many activities. Like many other local families we have made numerous good memories there; we have walked, jogged, biked, skated, flown kites, attended festivals, had picnics and used the playground. In fact, when my husband and I first moved to Burlington in 1998, we lived in walking distance to the park. Ireland Park itself was my next choice, partly because it was the site of the mural, and partly because it is such a Burlington way of life to have the kids in organized sports, like baseball. Green spaces are also an important element for quality of life in this city. The next panel is my favourite for a number of reasons. It was the first image that popped into my head when I read the theme for the mural. I love to take the family to Mount Nemo to go hiking. Just being in a beautiful wooded spot like this makes me feel connected to Nature. Not only is that beneficial to our physical, mental and spiritual health, but I always find it is a boost to my creativity. Also, there are often teachable moments with our kids, and the whole experience is good for relationship building. In this panel, my two sons make a cameo appearance as they look down at the turkey vultures riding the thermals. Then I painted Sherwood Forest Park which is also used for organized sports like baseball and soccer, and informally by runners, cyclists, people walking their dogs, or families just out for a stroll. I wondered if this location was not identifiable enough, and yet to me it was also iconic, both my boys played 3 on 3 soccer there, and it is a common sight in the summer time to see soccer fields filled with kids wearing their team colours. As it turned out, one of the men who installed the mural recognized the location right away. He said he plays soccer there all the time, and he seemed so happy to have that connection to the mural. That is the kind of reaction I am hoping for … that Burlingtonians who stand in front of the mural will be able to identify with it because they have had similar experiences. The launch for the event was held at the historic Freeman Station, which is undergoing renovations, hence the visible insulation & subfloor. One of the artists, Clair Hall, unveiled her mural on the outside of the building during the launch. I brought my ten year old to the ceremony, and he took these last two photos for me. He did a great job, listening to all of the speeches, talking to the Mayor, and not getting underfoot of the press! You can read more about them on the Burlington Public Art website here, or view the artists with their murals here. 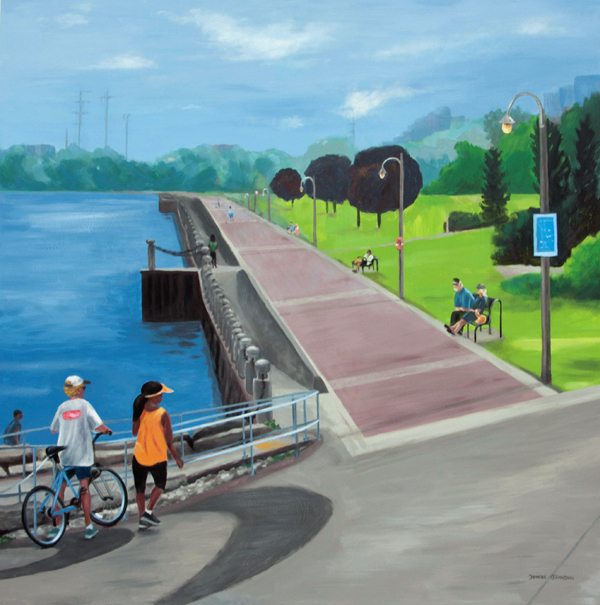 I’d like to thank the City of Burlington for this commission – specific to Burlington artists, and to Mayor Rick Goldring, Angela Paparizo, Adam Louis and anyone else from City Hall who were involved in this process somehow. Thank you, to the jury who selected me and to Kim Selman and Jeremy Frieburger of Cobalt Connects for guiding us through the process. 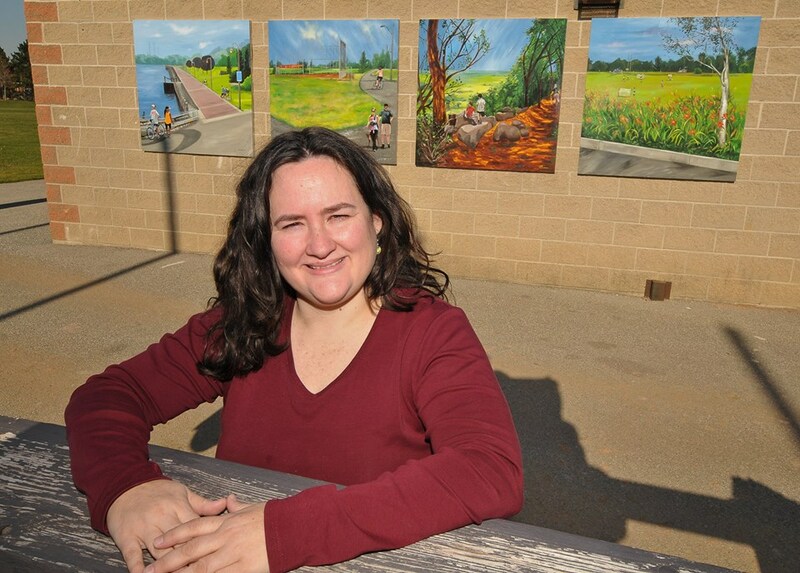 Thanks to Burlington Signs National for the installation, and to Burlington Post who posted this preview, with a photo of me in front of the Ireland Park mural. And above all, thank you to my family, who have been dragged into this artistic life of mine kicking and screaming, and sometimes applauding. Bonus: Click here to view the other mural I painted, 5 years ago, for the City of Toronto. Update: here is a new article about the mural launch, from the Burlington Post. 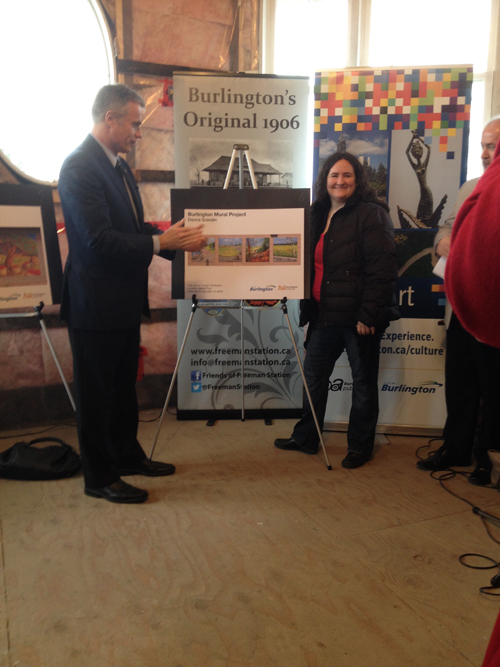 Also, here is the Burlington Public Art Map, the mural is #70. Choices, 24″x36″, acrylic on canvas, ©2014 Donna Grandin. $1400. It has been a long time since I have posted a new painting, but I do have a bunch to share with you, it’s just going to take a little while to get to them all. This painting was inspired by a photo shoot I did in my late grandfather’s garden. The tree with the ladder was actually in the overgrown lot next to his. I love the contrast of the man-made object with the wildness of the foliage. An attempt was obviously made to tame it at some point, but Nature always wins, because time is on her side. I enjoyed painting this, and the more I look at it, the more layers of meaning I discover. The beauty of art is often in what is implied. I welcome your comments. This painting is currently in my studio & so available directly through me. If it speaks to you, drop me a line … I offer very flexible payment terms, so that you can get the art you want. Tomorrow, I turn 40 years old. To celebrate that milestone, I have been taking a look back at some of my early work and posting them as the cover image on my Facebook page. 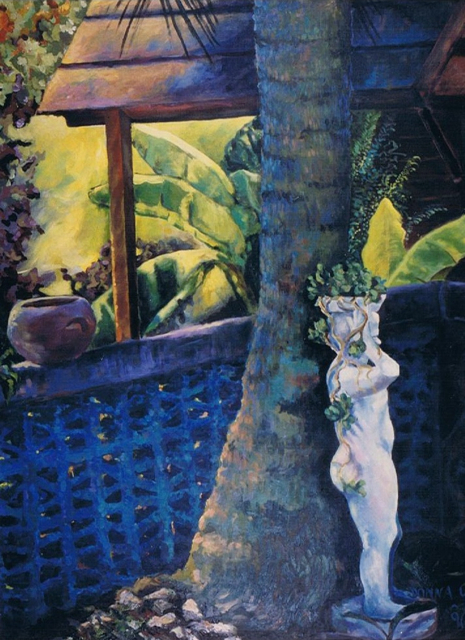 Most of the paintings in the collage above are from 1998, and were inspired by a trip to St. Lucia where my husband & I had our second wedding in as many years. I painted most of them sitting cross-legged on the couch in our one-bedroom apartment. Others I painted in my friend’s apartment in Toronto when I went to hang out sometimes during the week. 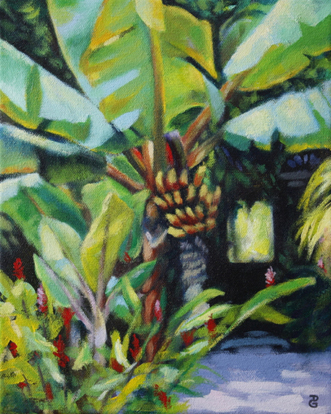 The smaller size of the paintings (compared to the 36″x48″ paintings in the Caribbean Imagery series) made it easy to work anywhere, even when I had to lug it all on the Go train. 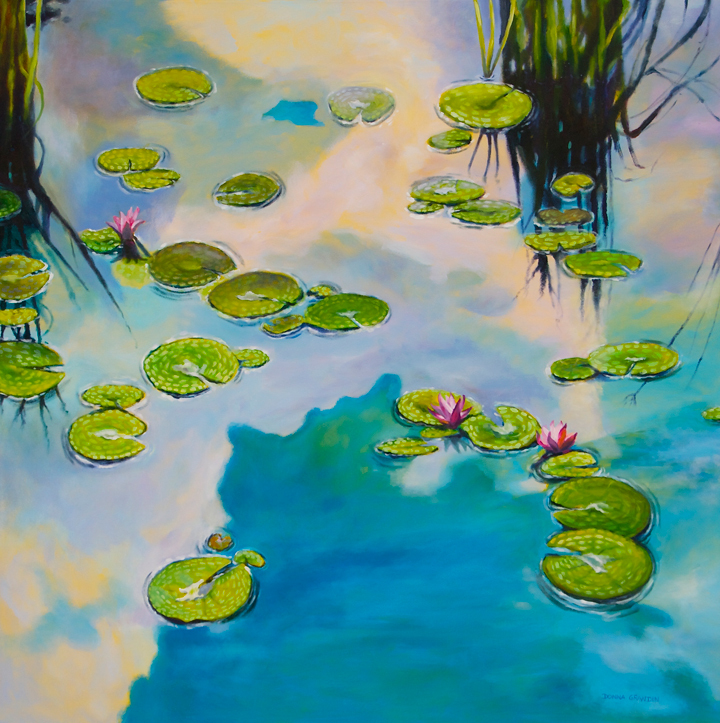 I first showed these in a solo exhibition at the Atrium Gallery in the Henderson Hospital in Hamilton, Ontario. It was a successful series in every way. The Diamond Falls Botanical Gardens in St. Lucia was a big inspiration here, I love exploring that place with a camera. There are trees hundreds of years old, tall & covered in vines, creating a canopy. A huge assortment of exotic plants, flowers & leaves … my favourite things. I wanted to share the exhileration I feel in this type of environment. If I didn’t have young kids, I would love to do a residency there, every day I would set my easel up in front of another plant or view to paint. 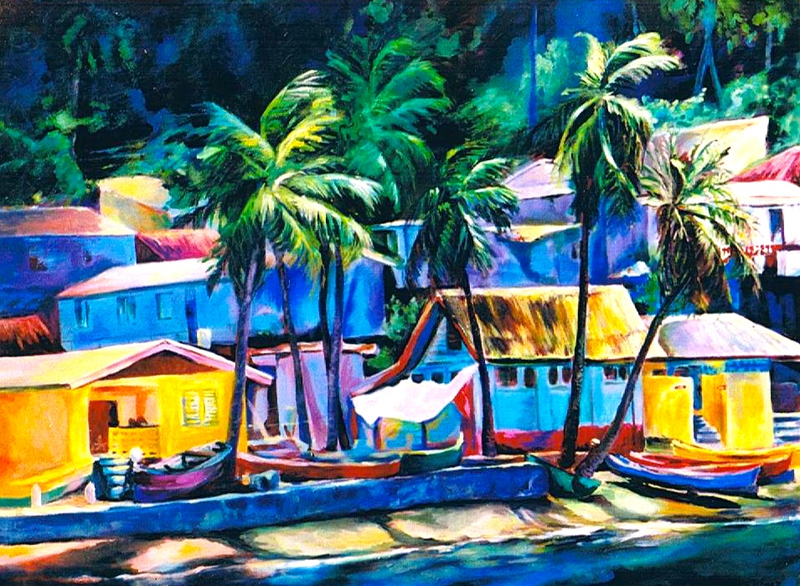 Actually, that reminds me of my big news – I am going to be in St. Lucia this summer, and I plan on doing some small paintings on location! I will post them here first and then share the link on Facebook. So, if you’d like to see them first, don’t forget to subscribe to blog updates via e-mail! Recently, I have been taking a look back at some of the work I did in my early 20’s. I am closing in on my 40th birthday, so I thought it would be fun to do a countdown, I’ve been posting a painting a day on my Facebook page, as the cover image. The paintings featured in this blog post are from the series I did in my last year of my BA in Art at McMaster University in Hamilton. 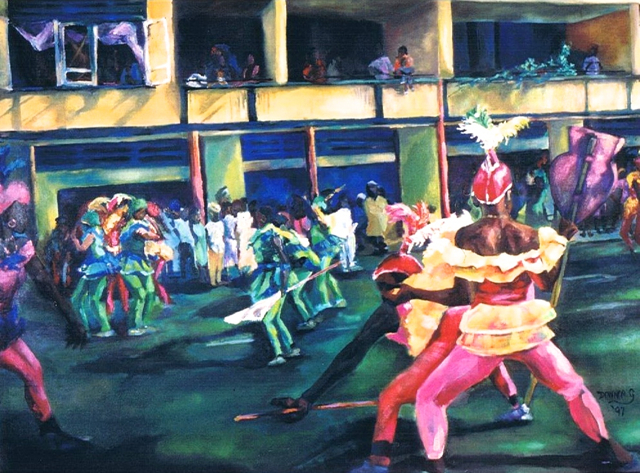 When I exhibited the series at Gallery on the 4th, Hamilton Public Library, I named it “Caribbean Imagery”. It was my first solo exhibition in Canada. Nicole was a Trinidadian girl I met in Psychology 101 at McMaster, she was one of my bridesmaids. I actually had her put on my blue wrap & took reference photos of her against the white door of my room in the student house I was living in. Then I just made up the background. 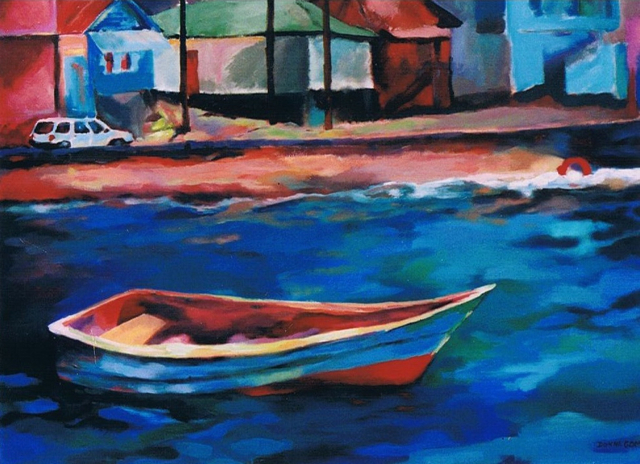 Not long after I did this painting, the shoreline was wiped out by a hurricane, and some of the residents had to be relocated. Many people commented to me that I had recorded a piece of history, and this painting was one of my most popular of the series. The collector who bought it had a large collection, but said that this one always drew comments from visitors, and when he relocated to the United States, he took it with him. We happened to meet a couple years ago & he showed me a photo of it hanging over his fireplace, next to it was a painting by my high school art teacher, Sir Dunstan St. Omer. This painting was included in our graduating exhibition at McMaster Museum of Art in Hamilton in 1997. It was placed on a feature wall which was painted the same yellow as the buildings in painting. This was the first painting of the series, one of my favourites, so I’ve held on to it. I apologize for the quality of the images, I did get professional slides made of the series, but I still haven’t scanned those slides in directly, so I’m not sure but these could be scans of photos of the slides, or worse yet scans of photos I took myself. Regardless, they are darker than the original paintings. I knew when I was painting “Coalpot” that I’d made a breakthrough in my work. This series is why I graduated from my program with Honours. Up until that time I was just full-filling requirements on my assignments, trying to get good marks. This series was more personal. Also, up until this series I worked in a variety of media, but I only did one oil painting that year, I realized that acrylics suited me best. 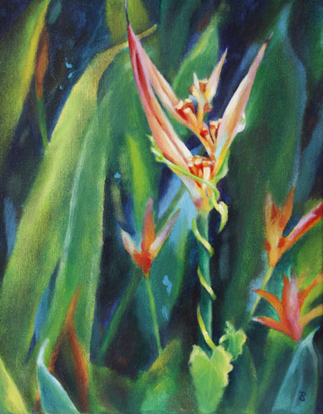 I could get brighter colours, which suited my tropical subject better, and I could work 12-16 hours straight on the same painting because I didn’t have to wait for it to dry. Then the next day I would do writing assignments, classes & household stuff … basically everything except paint. So that by the time I got back to my painting I was refreshed. I have always worked best this way. But I’ve never had as perfect a set-up as that last year of school where I shared a large studio on campus with a handful of other students, and had no other responsibilities but to do my best work. 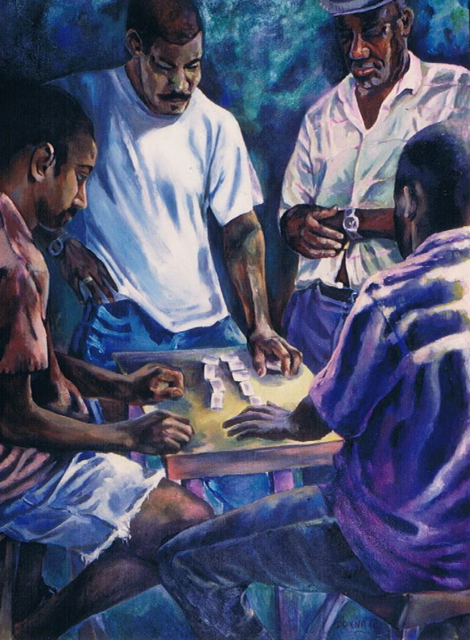 This painting was bought by someone working in the St. Lucia Consulate in Toronto, and the Prime Minister of St. Lucia saw it hanging there & asked for me to contact him about , etc. etc. I am not sure who owns it right now … but I believe it was resold in St. Lucia. The men are playing dominos on their lunch break. The man with the hat has passed away, but he was the father of the man in the painting further down in this post, called “Friends”. When I was choosing what I would paint for the year, it occurred to me that I may be marrying my boyfriend, and that would mean I’d have to stay in Canada. 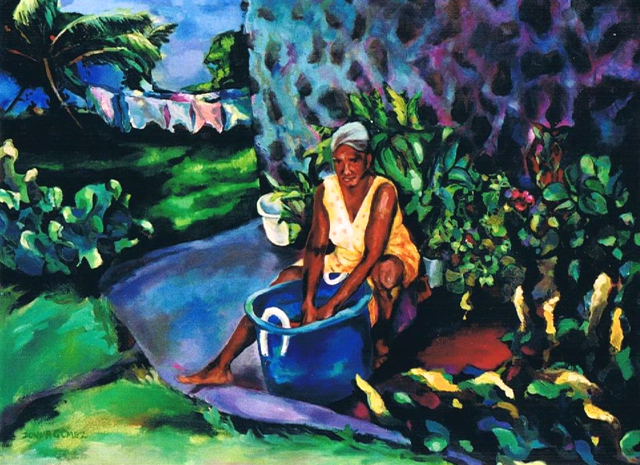 This series was me exploring the question of what St. Lucia meant to me. 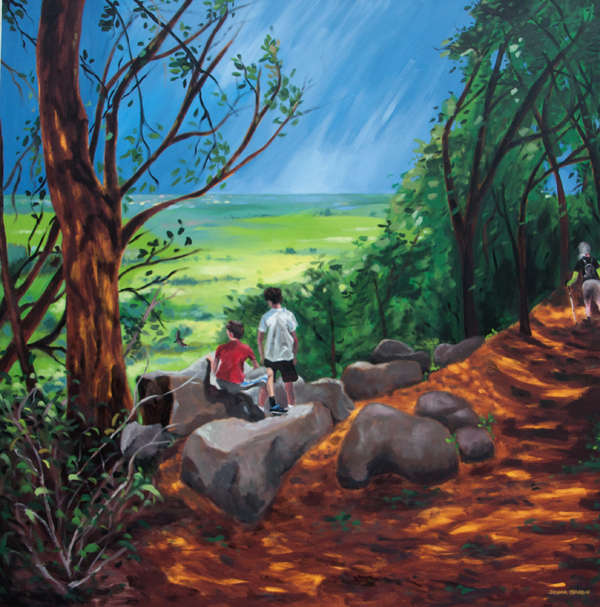 I worked on 2 paintings at a time, one figurative and one landscape, and by the end of the year one of the things I’d learned was that I was happiest paintings landscape, especially foliage. You can see in Vivian I was experimenting with how abstract I could paint foliage & have the painting still read as realistic. 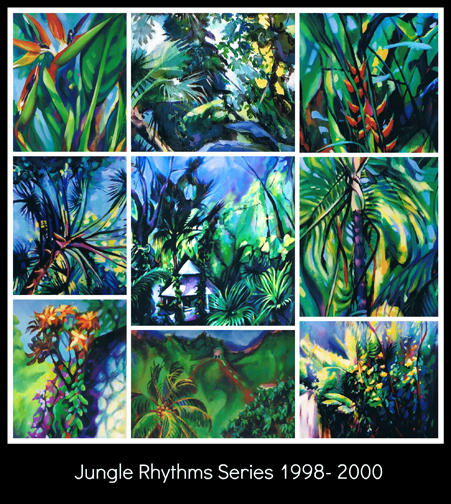 This was the basis of my next series, Jungle Rhythms. Her dress was always my favourite part of this painting, but when I painted the flowering bush I really tasted the freedom possible when painting foliage. Up close it’s dabs of colour, but further back they come together to form an image. These were people I worked with in the summer, they weren’t a couple – he walked by when I was taking the photo of her & just made himself at home. I thought it made for a great composition though. It also says so much about how laid back West Indians can be, even at work. Each work of art, even if I’ve just had it for a short time, has a story … or a history, made up of several little interesting stories. 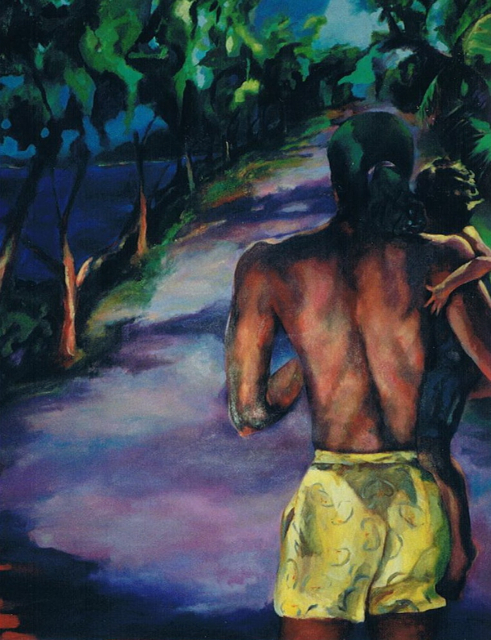 One story that sticks with this painting for me, is its “adoption” story. I took it in to Arts Etc. Gallery Shop & Art Rental, in the Burlington Art Center (now the Art Gallery of Burlington), and someone rented it for 3 months, then another 3 months before returning it. At some point I brought it back to my studio, where it sat while I travelled in Europe. Six months later, I got a call from the gallery – the man who had rented it for his office (a city planner) wanted to know if it was still available to buy. At that point I was either in my last trimester or had a newborn, regardless, the painting was still sitting in the studio. I read years later that the man had taken a position in Thunder Bay, and I always thought that was a curious thing … a Carnival painting in a very northern part of Canada. Then again, I never met the collector, maybe that painting was a way for him to stay connected to/express his roots. That’s just a part of the story that will remain a mystery to me. I might create the paintings, but when I let them go, they take on lives of their own. It is so strange for me to look at this painting, and realize that the little boy in it is probably about 20yrs old himself now! I actually photographed the two of them at a beach party, watching as our friends played an informal game of cricket, and the background is a view of Pigeon Island causeway in St. Lucia. This is a large painting, and there is quite the story that goes along with the tear on the bottom right corner (not seen here). However, I’ll save that story for when you visit my home studio & see it in person! Meanwhile, please follow my countdown retrospective on Facebook, until my birthday on July 8th. Although I was just doing this for my own amusement – and hopefully yours- I actually did hear from someone who wants to add one of these paintings to her collection. A few of them hang in my house, and a few in my parents’ house in St. Lucia. They are signed with my maiden name, Donna Gomez, and a couple as Donna G. because I thought I was being clever. There were a couple other paintings in the series, but they aren’t available anyway. If you see something you want, let me know. 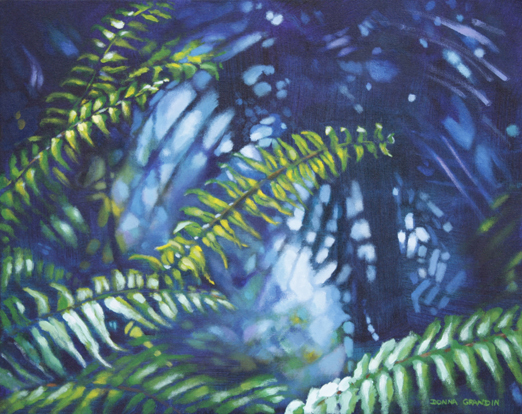 Fernscape, 16″x20″, acrylic on canvas, © 2014 Donna Grandin. It seems that whenever I let my heart take the lead, instead of my head, I do my best work. 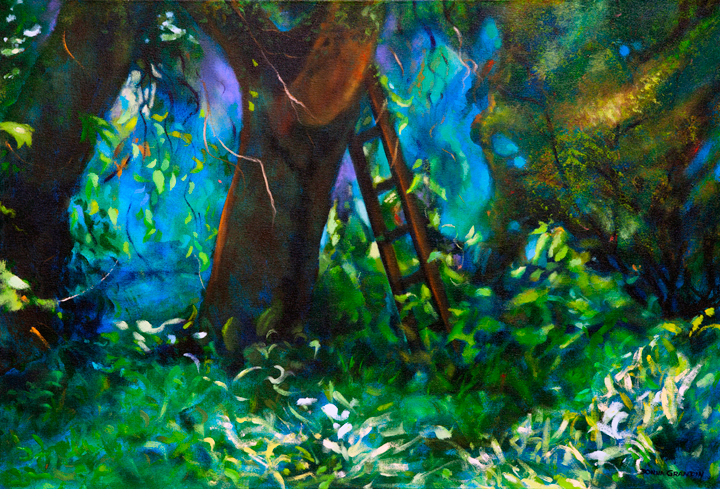 I have said for years that what I love to paint the most is foliage, and my artist statement always mentions organic shapes & patterns, and mood created with dramatic lighting and vivid colour, but not all of my paintings hit the nail on the head the way this one does. Painting technique can be learned, but finding one’s own unique artistic voice/style has no predictable timeline, no guarantee. Some artists are lucky to discover it right away, but I personally think that that is the case when they already have strong opinions, and a clear idea of who they are – OR, they have someone nurturing and mentoring their progress. Some artists, especially those working on commission, may never discover their own voice, because they are essentially allowing themselves to be a channel for their client’s voice. I am not saying that there is a right & a wrong, or even a finality about this decision. Making a living as an artist takes as much creativity as the artwork itself. It is possible however to do good paintings, that do nothing to move you down your own artistic path. I suppose I am talking here not of art as a commodity, but as a spiritual practice or art therapy. 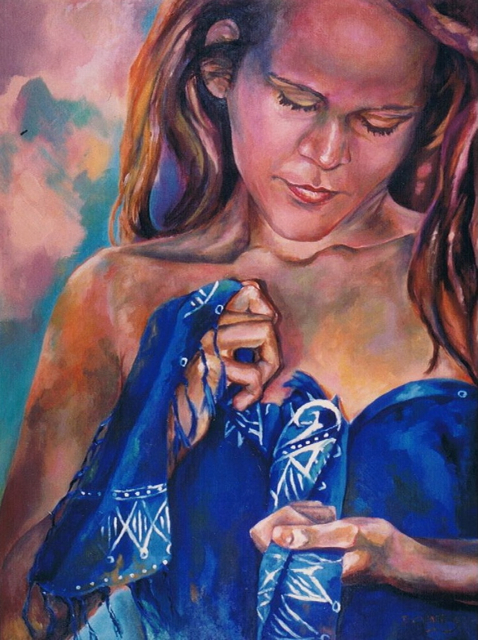 A creative process like painting can be a vehicle for personal growth, if the artist is mindful. Like writing “morning pages” (google Julia Cameron’s The Artists Way if you don’t know what I’m talking about), the painter can sometimes gain clarity & insight by being in the moment. Painting pushes everyday worries out of my head because it is like slipping into a stream of constant decision making. When I stop, it is a struggle to keep my head above water, which is why I try to have a couple paintings on the go at any one time. Canvases as mental life-rafts, I might be pushing the metaphor a little. Then again, I have heard authors say that writing a certain book saved their life, either due to the toxicity they were able to release, or to the positive energy it brought into their lives. The arts are how we connect to the rest of humanity, even our most desperate times. And it isn’t just a benefit for those of us creating. The general public may not be able to relate to my story of being moved to tears as I stood in front of a gigantic Sorolla painting in the D’Orsay Museum in Paris, but we have all laughed and cried because of a movie, we have all felt the grip on our hearts as music dragged us up and down through an emotional roller coaster. 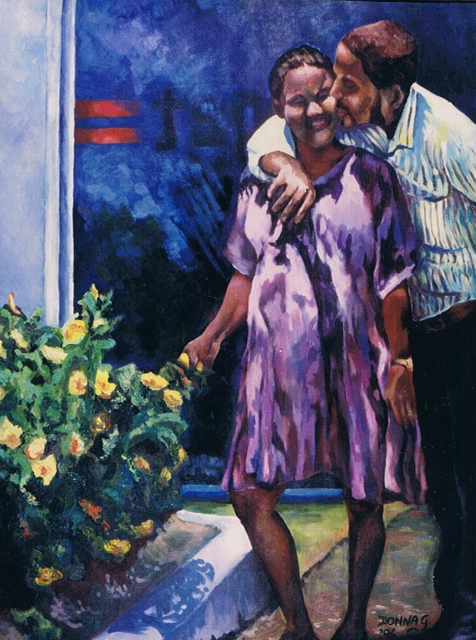 In fact, the chances of a viewer being deeply moved by a painting is partly dependent on personal taste, partly due to the sum of their life experience – the more experiences the more points of reference they have to connect with the work – and above all it has to do with how truly open they are to being in the moment, to contemplate, to feel, to trust in their honest reaction to the work. Appreciation for the arts is a gift we give ourselves, and others. It is a portal to receiving and sharing joy, peace, truth and a sense of belonging. This is the last painting of the challenge, a photo I’ve wanted to paint for a long time, I think it has a narrative quality to it. I could dispel the mystery right now by giving the location, but I’m curious to see who will recognize it. Let me know, in the comments below! Technically this painting was completed before midnight, but I waited to photograph it this morning. I really should have picked a simpler image so that I could get done faster, but I was drawn to this one, and I’d rather paint something that intrigues me than something easy. This is another painting that I could see myself doing again, larger. It would be completely different of course, since each brushstroke I make and each colour I mix is in the moment, but the general structure would be the same. Then again, there are so many things to paint – each day brings new inspiration if you’re open to it. So I probably won’t circle back. I’m going to create a collage of the 30 paintings, that will be in another post later today. One of the things I love about tropical landscape is its resilience. Even with drastic weather – drought and hurricanes – Nature persists, it finds another way to exist. If a big tree comes down, it lets light in for smaller plants to flourish. On one hand you have beautifully manicured lawns and flower gardens, which take regular maintenance to upkeep or else the wild will take over! On the other hand, left to itself, it turns into a big tangle of bushes, trees and flowers that are strangled by vine and bloom anyway! There is a intensity about this lush vegetation, the sunlit leaves and bright colourful flowers scream with optimism, with a great gusto for life. The landscape endures natural and man-made changes, and outlives us all. You can stand under a coconut tree and look out at the seascape, and the view, the feeling of the gentle breeze on your face, the sun on your skin and the sand between your toes is the same that someone would have experienced hundreds of years ago. Being in Nature makes you realize how small we are, how insignificant in the flow of time, and it gives you perspective. 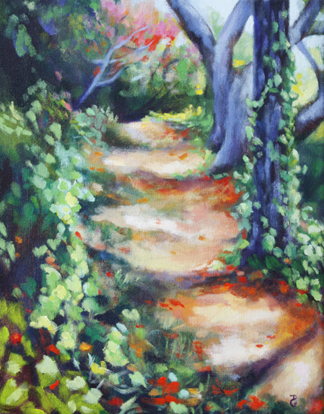 This painting is based on photos I took in an elderly friend’s garden, when I visited the island many months after she had passed. The aging house had been left to rot away, she didn’t have family or means, and only minimum maintenance was done in her later years. New owners had plans to level the building to the ground and build something new and big in its place. Her beautiful and bountiful garden was left untouched, except for neighbours and passersby picking fruit off the trees. The roses, ginger lilies, bird of paradise flowers etc. that she used to make bouquets as gifts for friends were strangled in vine. It was sad, and yet so beautiful. I took so many photos that day, and then on subsequent trips. Later, I did the same thing with my Grandfather’s garden, I was drawn to it. As an avid horticulturalist he had some amazing things in there, and although it has not been completely neglected, little by little the magic slipped away. At one point I was going to do a series of paintings based on this theme, but I guess I got busy with some project, followed by another project and it’s just been sitting waiting for me. I feel as deeply about this idea for a series as I do about the one yesterday. And although the theme/sentiment is different, the paintings seem to go together. I think it has to do with the personification of the flowers. I’ve always maintained that I’m not just painting a flower, the image usually has more meaning to me that that … which is sometimes reflected in the title. Hmm. The cogs are turning … time to figure out what I’m going to paint for Day 30!